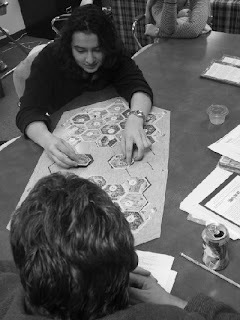 Settlers of Catan, a German strategy board game, is popular with a number of students and staff members this year. Creative play has gone beyond figuring out the best strategies to win to creating custom tiles to enhance the game play. Joey, Robert and Mat have so far created five custom tiles, which are randomly placed on the existing board. Volcano Tile: Gives any resource; when a 12 is rolled, everything around that tile is destroyed. Fortress Tile: Provides protection against the robber to anything surrounding the tile; if a 2 is rolled, active player can destroy someone's unconnected road or lay siege to a city, unless the player under siege spends one wheat and one ore to lift the siege. Tile does not produce any resources. Road Building Tile: Allows player to choose wood or brick when the number on the tile is rolled. City Building Tile: Allows player to choose wheat or ore when the number on the tile is rolled. Bazaar Tile: If player ahead of you rolls a double, then you roll a double, you can move the tile (a traveling port) anywhere on the board. Have fun enhancing your game with these tile ideas. If you've never played Settlers, you can try it out online at Aso Brain Games. The online version of Settlers of Catan is lots of fun, but be warned; there are no published rules for the game. You have to learn by trial and error, and at the beginning it is pretty frustrating! Then you are hooked.